I do have to admit that, as terrible as this movie is on damn near every level—and it’s an absolute nonsensical $100 million train wreck from end to end—I had a fine time laughing at it. Venom is the kind of movie where the star, Tom Hardy in this case, acts like he’s in a completely different film from everyone else—it’s also a waste of an incredibly talented supporting cast. And I think he’s the only one in on the joke. Maybe. I can’t tell. But whatever his stance, he just goes for it with reckless, admirable gusto. 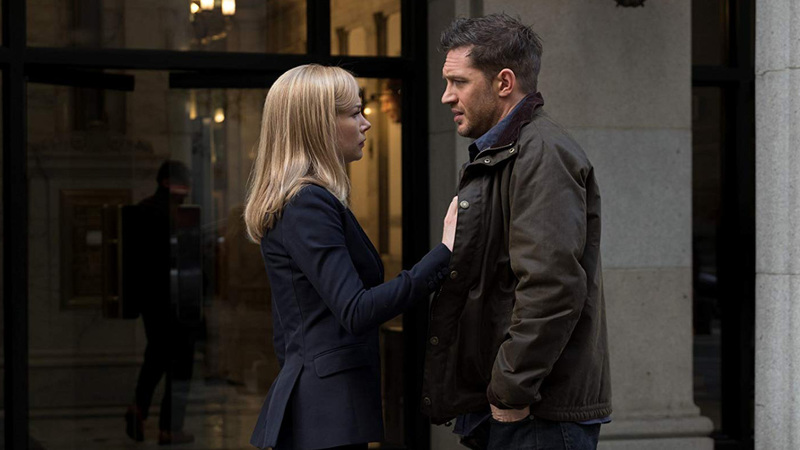 Hardy plays Eddie Brock, a crusading journalist with a long history of standing up for the little guy, taking down corruption, and burning bridges. When he takes on the corrupt, Elon Musk-y tech icon, Carlton Drake (Riz Ahmed), it costs him everything—his job, his apartment, and his fiancé, Anne Weying (Michelle Williams). 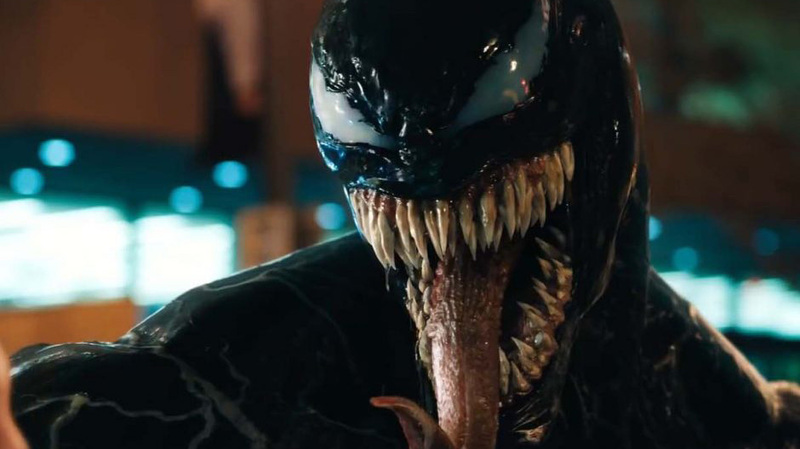 Trying to redeem himself, Eddie eventually becomes host to a smart-alek, head-biting, nigh-invulnerable alien parasite named, you guessed it, Venom. 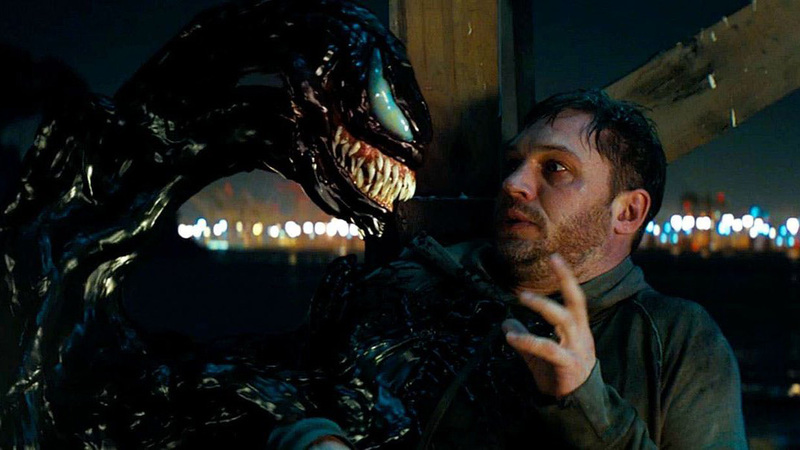 Venom exists primarily as a voice in Eddie’s head, except when he needs to pop out in janky CGI form to block bullets, kill baddies, or otherwise take control over Eddie’s body. Vapid and hollow, once Eddie and Venom finally hook up, it’s at the very least, never boring. Far from good, it’s not dull. 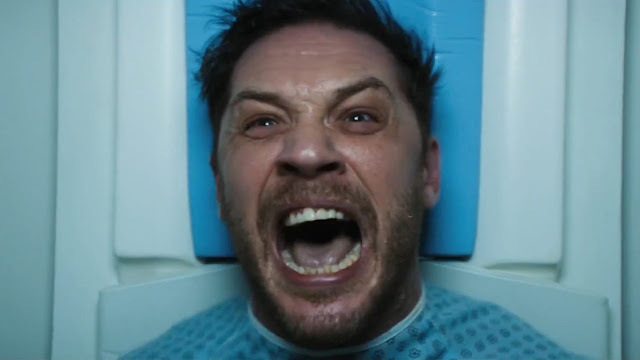 I don’t know that I can say Hardy saves Venom—it’s too far gone, too idiotic, too jumbled thanks to a script-by-committee approach that delivers wince-inducing lines, and director Ruben Fleischer continues his streak of not making a good movie since Zombieland. But I have to hand it to Hardy, he gives this crappy movie his all. In all honesty, if Venom was just Tom Hardy walking around bickering with deranged voice in his head, I could roll with that. It’s silly and absurd, but Hardy commits to the bit with gleeful zeal and the result is a manic and unhinged, flailing and twitching like a man possessed. At one point he pounds a bag of frozen tater tots and devours rancid trash only to vomit and gently bemoan, “What’s wrong with me?” in the most pitiful voice. He delivers a gonzo performance that’s completely detached from the surrounding movie. The rest of the film has zero idea what to do with him, so, like so much else in Venom, it’s a total waste, but he’s compulsively watchable arguing with himself in his goofy faux New York accent. It’s like Hardy is in a slapstick action buddy comedy while everyone else thinks they’re in a dark superhero drama—he somehow appears both entirely checked out and giving it everything he has. It’s truly strange and also the sole redeeming element of an almost indefensible film. Venom feels like a bizarre leftover from the 1990s in style, tone, quality, and ambition—and not a throwback, like something found covered in dust in the back corner of a long-forgotten warehouse. (A Venom movie has been in the works in one form or another since 1997.) Eddie has no arc and learns nothing except how to live with a symbiote. Everything happens too easily—oh, I’m infected by an alien parasite? Cool, on to the next bit. Venom himself becomes convinced humanity has value halfway through…for some reason I can’t discern—also, he says things like, “On my planet, I’m kind of a loser.” It’s a slapped-together mess of a film that plays like a comic book come to life, just not a particularly good issue.